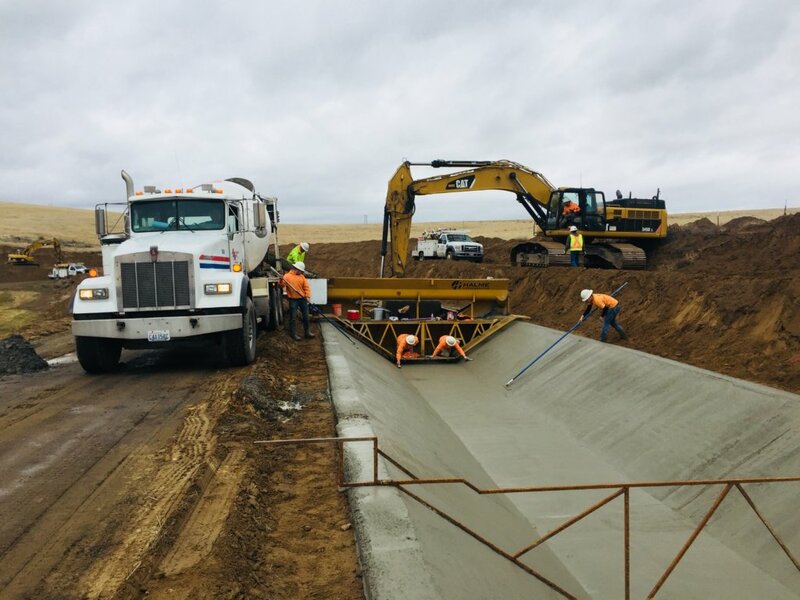 Each year at the Quincy-Columbia Basin Irrigation District (QCBID) we seek to improve the resiliency of our water delivery system while maintaining, modernizing, and extending the life of its ageing infrastructure. Irrigation water is the lifeblood of farms and families in our community and maintaining the arteries, consisting of over 2,000 miles of flowing waterways that makeup our water system is an awesome responsibility. In 2018, we invested $3.4 million dollars piping and lining canals, sealing cracks in broken concrete, and replacing worn infrastructure. These investments will improve operational efficiencies, reduce operational costs, and conserve water on our Project. The work completed this year is estimated to conserve over 4,800 acre-feet of water each year. 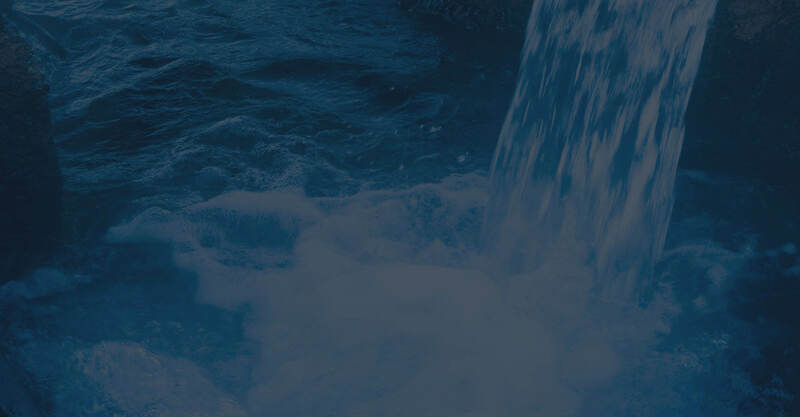 Since 2006, we have completed projects that have saved an estimated 42,000 acre-feet of water per year. One acre-foot of water is similarly equivalent to covering one football field with one foot of water. 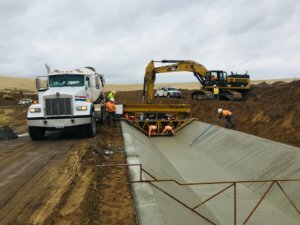 Utilizing Bonneville Power Administration, Bureau of Reclamation, Department of Ecology, and landowner cost-share programs, we secured over $800 thousand dollars in competitive grant and incentive money for work done in 2018, reducing assessed costs for landowners. Maintaining and replacing critical ageing infrastructure is one of our top priorities at the QCBID. A new 115,000-volt transformer costing nearly $300 thousand dollars was installed at the Evergreen Pumping Plant. This will improve safety and reliability of the original 60-year-old equipment. Four major pumps, one at the Quincy Pumping Plant and three at the Babcock Pumping Plant were reconditioned, capable of pumping a combined 60,500 gallons of water per minute. We continue to embrace state of the art technological improvements, such as installing automatic gates to ensure more reliable water deliveries. Inspections of our most critical infrastructure such as the massive 2.5-mile-long, 22-foot diameter Soap Lake Siphon also occurred which was found to be in good condition. Gophers continue to be a concern at the QCBID and their management is key for canal safety. They burrow into the sides of canals causing damage to them. We pay landowners $1 for every gopher trapped. Last year over 31,250 gophers were trapped by landowners, slightly down from nearly 36,000 in 2017. Our annual elementary school Otto Otter Program was also a success. Each year we visit schools in our communities and talk to third and fourth graders about water and irrigation canal safety. Our river otter mascot named Otto educated the community about the dangers of canals and highlighted the importance of staying out and staying away from them. Throughout the year we worked closely with the Bureau of Reclamation, Department of Ecology, Department of Agriculture, Fish and Wildlife and many other agencies to ensure that we manage our complex region in a collaborative way. We thank them for their efforts and look forward to doing more great work together in 2019. We are continuing to invest in our employees. We’ve implemented new health awareness programs such as “Stretch & Flex”. Each morning before receiving their assignments we stretch together. Not only has this program reduced worked place injuries, but it promotes teamwork and relationship building across departments. The work we accomplish would not be possible without the skilled employees who work here. As we begin the new year, maintaining and modernizing ageing infrastructure, water conservation, and community outreach will continue to be top priorities. We have partnered with the Bureau of Reclamation and have received over $83,000 in federal money to research ways to reduce aquatic weeds and algae growth in irrigation canals. We spend over 1.3 million dollars annually controlling weeds, costing landowners nearly $5 for every acre they farm. We have $3.8 million dollars in system improvements planned for 2019 with over $1 million being funded by grants and incentive programs to reduce costs for waterusers. It has been an honor and privilege to work for our community through the Quincy-Columbia Basin Irrigation District. I couldn’t be more thrilled to be a part of the team and work with such great people for great people. I am excited about all that we have accomplished in the past and all that we have happening in this new year and beyond. At the Quincy-Columbia Basin Irrigation District it truly feels like opportunities are unlimited.